Former President Jimmy Carter will be the featured keynote speaker at the first Plains Chautauqua weekend event themed “A Journey to Plains,” May 2-4, 2014. Planning by the Plains Historic Preservation Trust for the weekend Chautauqua, which since 2008 had been a multi-evening event, is inspired by former First Lady Rosalynn Carter’s visit to DeFuniak Springs as featured keynote speaker at the 2013 Florida Chautauqua Assembly in DeFuniak Springs. President Carter will speak at the lectern which Florida Chautauqua President Christopher Mitchell presented to Mrs. Carter in DeFuniak Springs during her historic visit to Walton County, and Florida Chautauqua Center board member and historian Robert Daniel will present historic documents and information to the Plains delegation to assist in their research development. 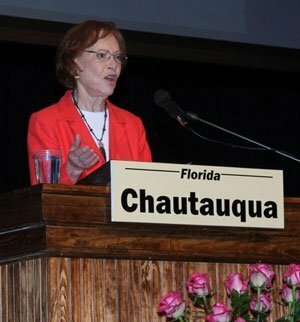 Former First Lady Rosalynn Carter speaks at the 2013 Florida Chautauqua Assembly in DeFuniak Springs, Florida. Photo by James Meadows.